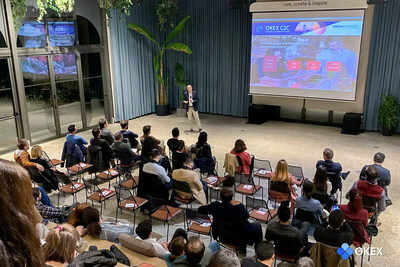 MALTA, March 27, 2019 /PRNewswire/ -- OKEx, a Malta-based world-leading digital asset exchange, announced its expansion to Turkey by launching Turkish Lira on its C2C (customer-to-customer) fiat-to-token trading platform at its C2C Network Launch Event in Istanbul. The Turkish Lira C2C trading service will be available from early April. To cater to the upcoming traffic from the Turkish market, the Turkish language is now also available on OKEx.com, in addition to the already supported 8 languages. "Turkey is the country that has one of the highest percentages of crypto ownership in Europe, and it owns one of the fastest growing crypto communities in the world. While Turkey is entering an economic recession, people are finding ways to safeguard their wealth and many of them have turned to digital assets. At OKEx, we are actively looking for ways to serve the community here. By supporting Turkish Lira, we hope to provide an additional solution for the local people to address their concerns on economic stability," said Andy Cheung, Head of Operations of OKEx. At the evening networking event hosted yesterday in Istanbul, the Turkish capital, OKEx brought together a group of blockchain and technology enthusiasts to discuss the crypto and blockchain development in the country. During the "mindxchange" session, several crypto leaders and entrepreneurs generated an insightful conversation about the mass adoption process of digital assets in Turkey. The panelists, including Hakan Kayış, Founder of SocialTheGang, Tolga Odoğlu, Managing Partner of Menapay, Eray Eren, Co-founder and CPO of Colendi, Elçin Karatay, Lawyer of Solak & Partners, shared their views about how to promote crypto adoption and discussed the potential of blockchain applications in Turkey market. OKEx C2C trading platform allows users to place orders with self-selected exchange rates and payment methods to buy or sell Virtual Financial Assets with fiat currencies, benefiting users by offering a low-volatility market and zero transaction fee. Turkish Lira C2C Trading Platform will be officially available in early April. OKEx C2C trading offers a decentralized platform for the buying and selling of Bitcoin (BTC), Tether (USDT), Ethereum (ETH), and Litecoin (LTC). To trade on the C2C platform, users in Turkey have to complete simple steps, including KYC level 1 verification, as well as linking a valid Turkish bank account and a mobile number. For more information about C2C trading, please visit here.